The KWE is online throughout 2019 thanks to a web hosting gift from the Whatcom Community Foundation, Bellingham, Washington. The gift was given in memory of the victims of 9/11 as a reminder to Americans that freedom is as precious as life itself, and just as easily taken from us if it is not protected. May God protect and preserve the United States of America and its citizens. *Updates are generally made on two locations on this page: Latest News and Newest Additions. Be sure to check both places when you see that an update has been made. This website was created by Lynnita Brown, founder, Korean War Educator. Lynnita, who holds Korean War veterans in the highest regard, is solely responsible for the monitoring and posting of all of the contributed and self-generated text that appears on the Korean War Educator. Technical changes to the website are courtesy of Webmaster Jim Doppelhammer, who also has a strong appreciation for our nation's veterans. Lynnita can be reached at 111 E. Houghton St., Tuscola, IL 61953; ph. 217-253-4620 (home) or 217-253-5171 (store Thursday-Saturday). Lynnita's e-mail is lynnita@thekwe.org. Our friend, Sheila Kronenberger of Belleville, Illinois, sent the KWE a sad message today. Ray C. Vallowe, an Army survivor of the Chosin Reservoir and contributor to the KWE, died this week on March 28th. His funeral is tomorrow, April 1st. Ray provided important research on this little-known aspect of the Korean War and the Chosin Reservoir. Our thoughts and prayers go out to the family of this wonderful man. In other news, the KWE received two financial contributions this week. A new member joined. Her name is Kittie Gugenheim of Texas. Her father's short memoir (LTC Ted L. Maloy of Texas) was recently activated on this website. We have a number of life members, but only a handful of general members, so we are especially pleased to have Kittie as a new member. In addition to Kittie's contribution, our long-time supporter, Billy Wright, sent a check for $50.00. The KWE's treasury is nearly depleted, but the website continues due to restricted funds in the KWE's web hosting account. The KWE received a lovely Christmas surprise when long-time supporter and life member Sheila Kronenberger of southern Illinois sent a $500 check. We are so grateful for the donation. Due to computer glitches and repair bills, the arrival of the gift was perfect timing. The KWE can now catch up on its bills and move forward into 2019. I called to thank Sheila via telephone, but want to publicly thank her for her ever-generous contributions and support of the KWE. She is a jewel. Last night my husband Dale and I were discussing why I have added so many American notables who served in the military during the Korean War to the KWE. Years ago I was told that only people who were not smart enough to go to college entered the military. As the daughter of a veteran who was an outstanding father and a highly respected local businessman, I was highly offended by that statement. The proof of such a blatant lie comes not just in the form of the many renown veterans who went on to become outstanding contributors to their community, state, nation and world. It also comes in the form of the thousands (millions) of veterans whose names might not be as recognizable as the KWE's "American Notables", but who were just as smart, productive, good and decent people as the "notables." They also contributed to their community, state, nation and world--and their families and friends hold them in the highest regard. So does the KWE. Individual Korean War veterans and Korean War veteran reunion groups often have small, medium and large websites on the Internet. Unfortunately, as the veterans age and financial resources to stay online dry up, these informative websites are being pulled off the Internet one by one and the history found on them is being lost forever. The Korean War Educator is a team effort between Lynnita Brown of Tuscola, Illinois, as well as Korean War veterans and their families worldwide. Lynnita is directly involved with the daily updates visitors see on the KWE. All text appearing on the Korean War Educator is either generated by or routed through Lynnita. Webmaster Jim Doppelhammer handles the technical aspects and makes improvements to the Korean War Educator website. If you find a technical glitch anywhere on the site, be sure to contact Jim at webmaster@koreanwar-educator.org. If you find text errors on the site or want to add material to it, be sure to contact Lynnita at lynnita@thekwe.org. We'll see what we can do to fix them. If our KWE visitors see typographical and/or grammatical mistakes, Lynnita encourages those who discover them to contact her. There is no such thing as an error "too small" to be corrected. Lynnita can be reached by phone at 217-253-5171 (her store) from 10 a.m. until 3 p.m. Thursday through Saturday (and generally on Monday-Wednesday from May to December, too--but not always!). Her home phone number in Illinois is 217-253-4620 (she rises early and stays up late). Feel free to reach Lynnita is at her home number if you can't catch her at her store. If she is not home, your call will be picked up by an answering machine or her husband, Dale. Please feel free to leave a message. She will call you back--probably the same day or evening. Her e-mail address is lynnita@thekwe.org. As of April 17, 2011, the KWE has had 192,390 since January 1, 2011. A review of the Year 2010 traffic statistics for the Korean War Educator shows that 681,927 visitors stopped by to view the Korean War Educator from January 1 through December 31, 2010. The Korean War Educator had 810,676 visitors in the year 2008. As the site continues to grow, so will the number of visitors. As an example of the KWE's fantastic growth rate, just think. In the year 2004 the KWE had only 24,152 visitors! The majority of visitors to the KWE website were from the United States, with visitors from the United Kingdom second and visitors from China third. As of January 7, 2008, the KWE had 141,459 page views per month and an average of 2,000 visitors per day. The KWE website contains 5,645 files (748,966 KB). It has 3,364 photographs. There are 21,404 hyperlinks. Due to a change of web hosts, we only have January and February and the December statistics from 2007, showing approximately 27,500 visitors per month in January/February and 30,000 visitors in December. From 1/1/06-12/31/06, the KWE had 183,640 unique visitors (again, many came back to view the site over and over again, but they were only counted once) who viewed 1,132,528 of its pages. From 1/1/05-12/31/05, the KWE had 222,072 unique visitors (many came back to view the site over and over again, but they were only counted once) who viewed 775,446 of its pages. The Korean War Educator started to offer memberships at the end of September 2003. For the very first time, the Korean War Educator was able to use the General Membership dues ($10.00 annually) to establish a general operating fund that has enabled Lynnita to pay for her monthly internet connection, as well as incidentals such as reams of copy paper, ink cartridges, postage, etc., without taking it from her own pocket. Not only that, the Korean War Educator established an Endowment Fund to keep the Foundation going long after those of us living today have passed on. With an initial deposit of $50.00 (one half of the cost of Life Membership dues going into the Endowment) that special reserve fund has now jumped to $2,135.53, thanks to the most recent donations to it from the KWE's new life members Tom Cearlock and Carl Galey of Illinois. Our goal is to build up the principal in the account so that the annual interest will pay for each year's web hosting fees. You can find the roster of Korean War Educator members on the KWE’s "Support" section at the top of all main pages. We are hoping that many more of our visitors will come aboard to help this great Korean War website become even greater. All funds go to support the Korean War Educator Foundation. No salary money is expended. Most of the KWE's limited funds are expended for internet/website expenses and printer ink. It would be great if some of our regular visitors would support this important website by sponsoring a year of hosting (or more). Contact Lynnita at lynnita@thekwe.org about this possibility if you think you would like to sponsor a year's worth of KWE. The list of website sponsors to date is listed on the Support page of the KWE.. 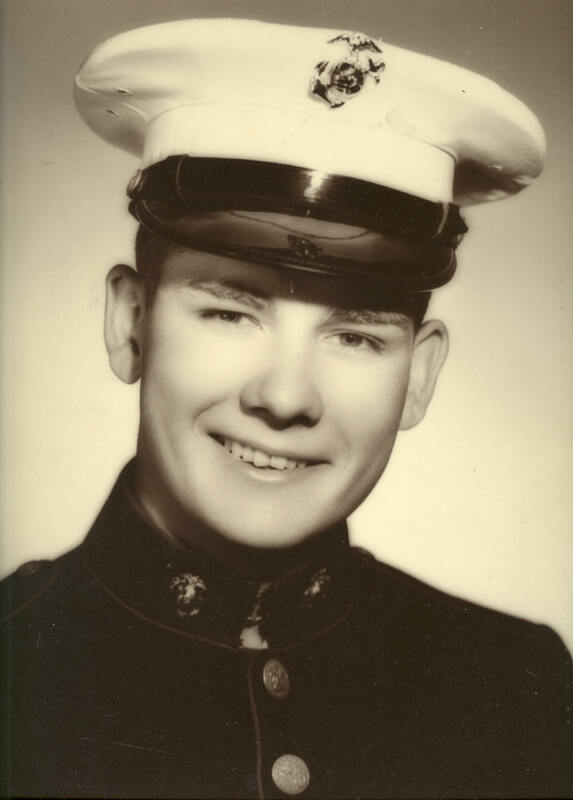 It is with great sorrow that I inform Korean War veterans and our other site visitors about the death of Julian "Buck" Blagg, original webmaster of the Korean War Educator website and a fine Marine. He died of lung cancer at 6:00 a.m., Sunday, June 1, 2003, at the age of 66. Julian was my dear friend, and I miss him. He helped me give the world the Korean War Educator.